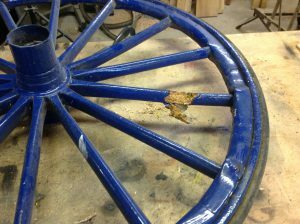 I frequently get asked to repair wooden carriage wheels, and they are always a voyage of adventure as you never know what your going to find, which also makes it the hardest to price, which is another problem as everyone wants to know before you start what its going to cost. A typical example would be the wheel in the picture which came in to have a broken spoke replaced. In order to replace the spoke you have to first remove the rubber tyre, steel rim, and a section of felloe to get to it. Usually at this point I discover all manner of issues, and that the old time craftsmen where just as capable of a “bodge Job” as modern ones. So the blue wheel pictured illustrates this perfectly. It came in with a broken spoke which turned out to be rotten and riddled with wood worm to a point where the wood crumbled away when touched. The Carriage had obviously not moved for a while and water had got into the joint between felloes and spokes, causing the felloes to swell and also rot along with the end of several spokes. Our tale of woe continues as the wheel I suspect originally from America with steam bent felloes covering 7 spokes each, rather than the European Sawn felloes which conventionally bridge 2 spokes, had previously been worked on, and one half of the wheel steamed felloes had been replaced with sawn, some of which were solid and some rotten, all of which had been hidden under many layers of paint. To cut a long story short I ended up replacing several spokes, most of the felloes, but retained the hub, rubber tyre and steel rim which were refitted. Once its had a new coat of paint its good to go, back on the carriage. 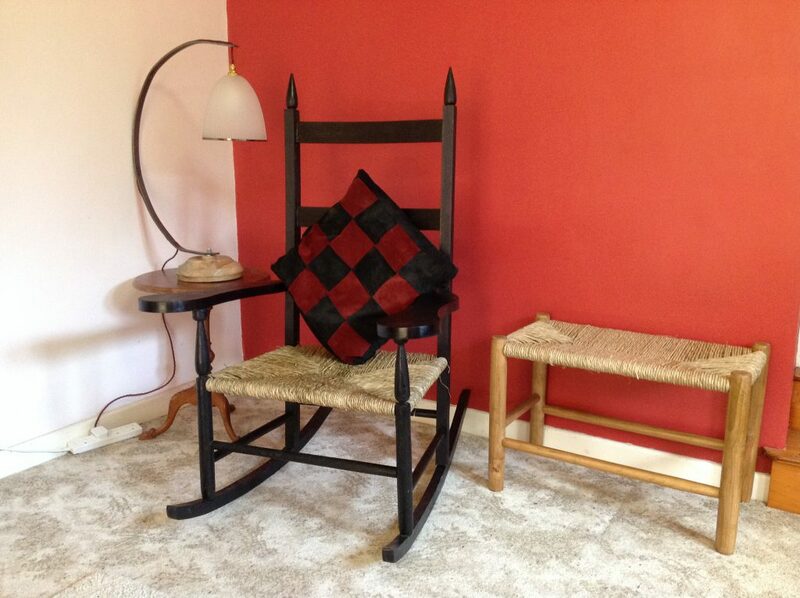 A selection of items from our workshop, Rocking Chair, Bench, Side Table and Table Lamp. With a few days spare between projects I have been looking ahead to the summer where I shall be exhibiting at some Rural Shows in the East of England. 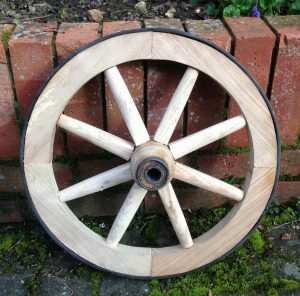 I earn my living as a wheelwright, a maker of wooden wheels, and that’s what I will be primarily concentrating on. However in an effort to broaden my appeal I shall be featuring some of the other wooden items I make including my latest project. Which brings me nicely to the latest item to emerge from my workshop, a rocking chair. 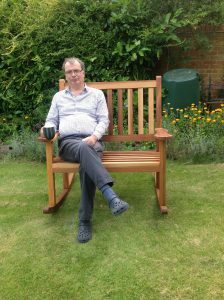 Over the years I have made a number of rocking chairs including a double rocking bench for the Garden. The common theme or style is the American Shaker style. I rather appreciate the elegant simple lines, and having studied a number of books on the subject I have come to understand the simplicity of design is matched with a ruthless efficiency designed to maximise the raw materials and reduce labour costs. 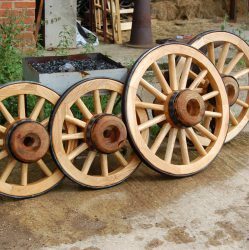 As wheelwrights we build the rims of wooden wheels in sections, by cutting them out of a solid plank, therefore when we were looking to make the rockers in the past we cut them out of a solid plank. The shaker method is too steam a straight piece of wood into shape, Cutting a straight piece is much faster than shaping a curve, and by steaming it into shape you reduce considerably your waste material. So for this project out came my steam box for the rockers, the back posts, and the curved back sections. For this project I have used Beech wood, an excellent wood for furniture and steaming, but if I am honest its not the most exciting grain pattern to look at, therefore a perfect opportunity to try Black Polish something I have had waiting on the shelf for the right project to come along. The end result as you can see from the picture is rather smart but it could be suggested has strayed away from Shaker towards Gothic, or has been suggested a “Nervous Goth” ( shaky gothic). So what do you think Shaker or Gothic? For someone who doesn’t claim to be a chair doctor I spend a lot of time working with chairs. Historically a wheelwright would have worked on chairs as the skills and techniques are complementary. In this instance I found this Victorian chair frame in a local farm sale for the princely sum of 50p. At Some point in its life someone had attempted a refurbishment and had cut away the original woven cane seat and back, replacing it with plywood, and then liberally and badly applied gloss white paint. 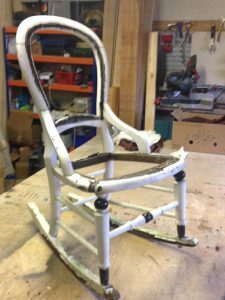 The first task was to remove the plywood and strip back the paint to reveal a fine mahogany frame underneath. The freshly revealed wood work was then sanded, sealed, and French Polished, including one coat of Red Polish to accentuate the colour of the natural wood. Finally the seat and back was re caned with the original split cane. 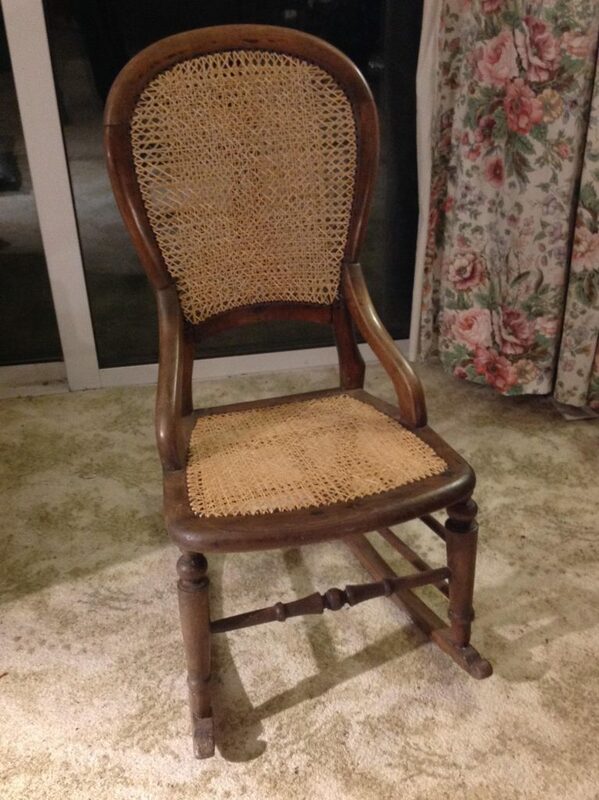 We cant claim its as new after all its a 150 year old chair, but its certainly good for a number of years yet. Having finished it we can attest to its comfort. A very comfortable chair. If you look back in History before the days of industrialisation, The wheelwright would create anything made out of wood for a village in the same way the blacksmith would craft anything from metal. So in addition to wheels the wheelwright would make furniture, and even serve as the undertaker, building the coffins and the hearse. Now it so happens I have made a few coffins for theatrical purposes, however that’s a facet of life I am quite prepared to let others deal with. So Whilst I may have bypassed Coffin making I continue the practice of a wheelwright who looks at all forms of wood work, in particular I practice the trade of a Chair Doctor. I make new and repair old chairs. I am particularly fond of making Shaker style chairs and rocking chairs, I appreciate the design and it fits my skill set. 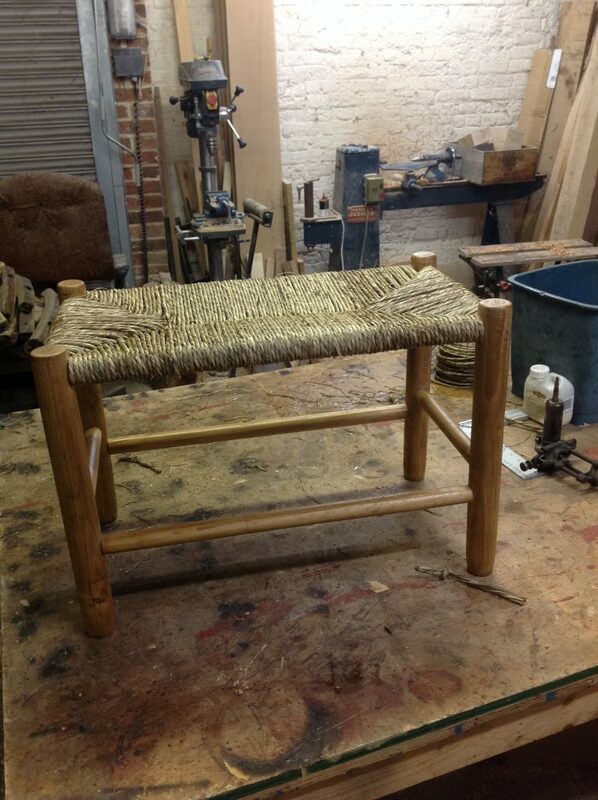 Turned wooden legs and woven seats be it rush, cane, or shaker tape. The picture at the top shows a shaker style bench, with turned cherry wood with a woven rush cord seat. A product of our workshop. If you would like one or something similar get in touch. A typical project for us is the one we have just installed today at Canary Wharf, a customer we have served for many years. 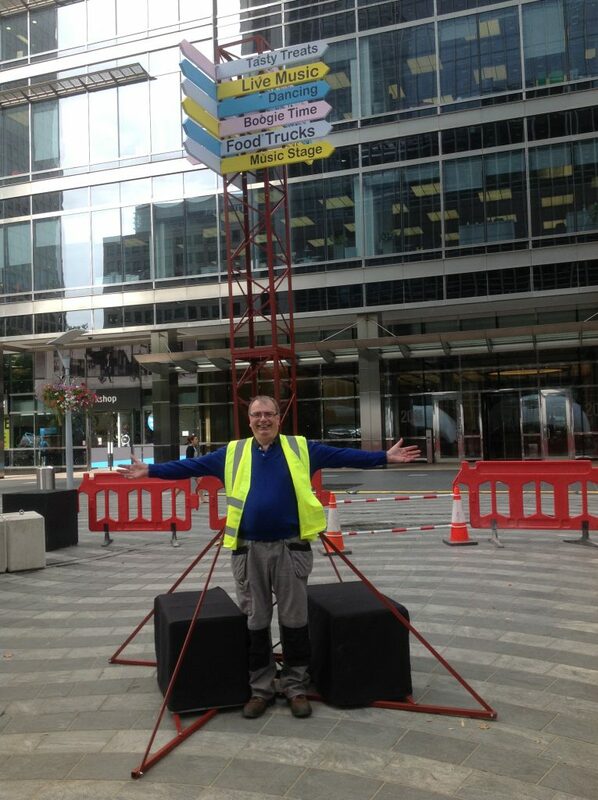 They are having a trendy “Urban Food Festival” and wanted a free standing sign post, to act as a focal point, and to give directions to approx. 20 destinations. They wanted it to look modern, urban, whilst at the same time reminiscent of those sign posts you see at tourist destinations with multiple signs pointing in all different directions telling you how far it is too New York, or Basingstoke. It had to be Free standing onto a solid floor, assembled in a few hours ideally without expensive access equipment, and able to act as a central support for overhead festoon lighting. Oh and by the way you have a 10 days to design and build it. 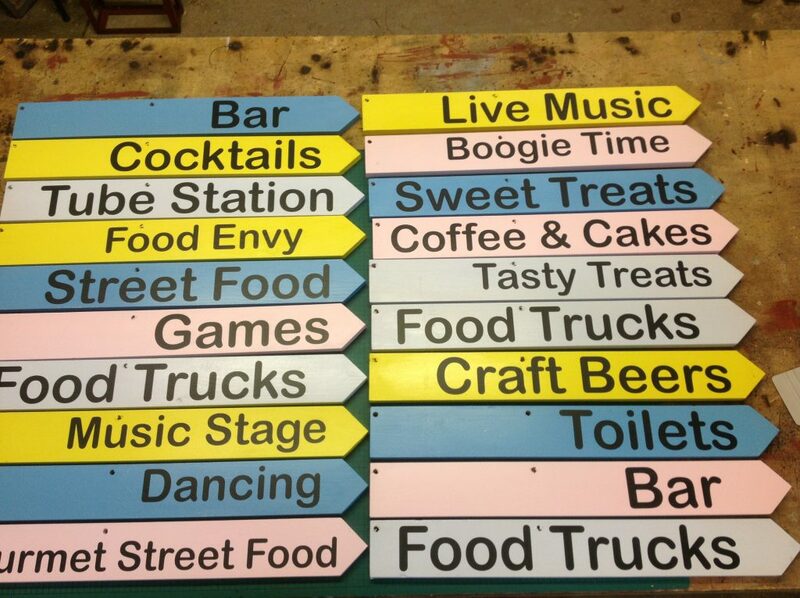 Now whilst we don’t aim to be signpost manufacturers we do understand temporary structures. Therefore we designed an Urban Themed structure manufactured by us from welded steel lattice, 4mts high, which is self supporting with 2 x 150kg water weights. Built in several sections it can be easily assembled by 2 people in a couple of hours, and yet still fits into the back of a medium sized van for transport. The signs supplied in bright modern colours, which are fixed in site are reusable, so once this event is finished the whole structure is taken down, put into our stores, and then gets reused next time, albeit with different wording. the customer was delighted and we are rather proud of this one. 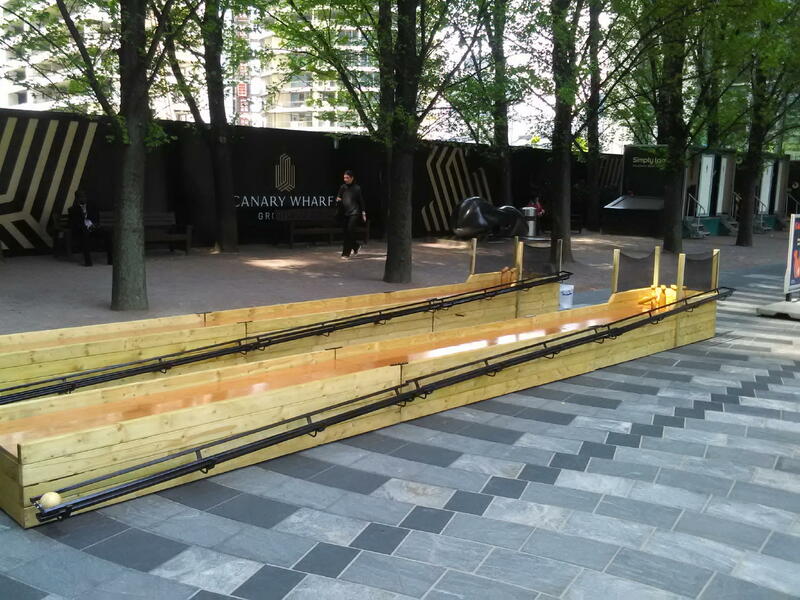 This weekend we installed a pair of Ten Pin Bowling Lanes at Canary Wharf – Montgomery square. Each of the two lanes is 7.2mts in length x 1mt wide and were supplied with 10 hand turned skittles, plus spares, with a ball return along the side, all designed and built from scratch by us. These are a feature of the estate free summer entertainment, and from the initial reaction are going to be very popular so if you would like to try them for yourself you will need to get there early. Alternatively you could always get us to make one for you. My name is Tom Green and people often ask me what exactly is it you do? The short answer is I make things. I am most comfortable working in wood, steel, or leather, and I specialize in one off or short run projects. 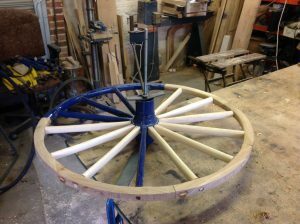 20 years ago when I set out to become a wheelwright, I thought I would just make carriage wheels, and I still do, but of course what happens is you make the items your customers ask for. However the best way to find out is have a look at my youtube channel .There or in the Galleries on this website you will see examples of my work, links to my blog, and details of where to get my books. If you have a project in mind do get in touch.